When Wall Street downgrades a stock, it doesn't mean you should look away. Rather, you should look closer. In downgrading American Water Works (NYSE:AWK) from buy to neutral, Merrill Lynch believes there are better ways for investors to wet their whistles. The consensus price target now stands at $71.92, with shares currently trading between $81 and $82. Although Merrill Lynch believes the stock is overvalued, there's plenty of reason to believe now is as good a time as any to pick up shares. At first glance, it may seem that Wall Street has it right -- that shares are too richly valued. After all, the stock is trading about 31 times earnings, and its five-year average P/E is a little over 20, according to Morningstar. But we need to consider the earnings multiple from different points of view. AWK PE Ratio (TTM) data by YCharts. For one, the stock doesn't seem quite as expensive when stacked up against the competition. 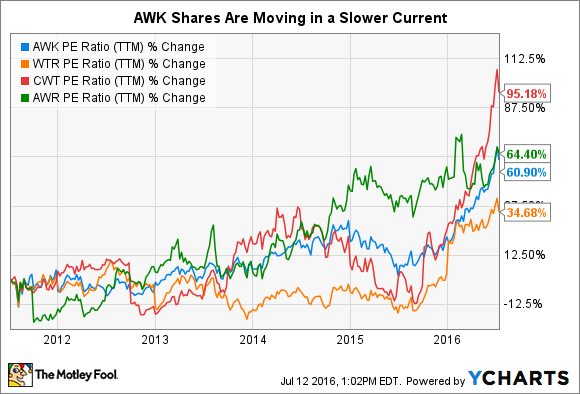 It trades at a multiple a little less than halfway between the most richly valued peer, California Water Service Group (NYSE:CWT), and its most least richly valued peer, American States Water Company (NYSE:AWR), and it trades slightly higher than its peer closest in size by market cap, Aqua America (NYSE:WTR). From Merrill Lynch's perspective, the company's stock -- trading about 14% higher than the consensus price target -- has gotten a little ahead of itself. But in comparison to the rising multiples at which its peers are valued, American Water Works doesn't seem so bad. If any company seems to be swimming in waters over its head, its California Water Service Group. Its shares are trading at a multiple nearly twice that at which it was trading five years ago. 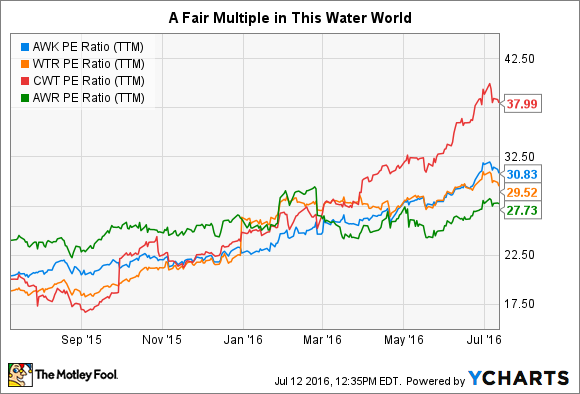 From an earnings perspective, American Water Works doesn't seem so unreasonably priced compared to its peers. How about from a sales perspective? We'll use two metrics in order to assess the companies in this regard. First, we'll put the free cash flow to sales (FCF/S) metric to use. This measures how well a company is able to convert its sales into cold, hard cash. Oftentimes, management can fudge the numbers and produce earnings figures that are a bit misleading. Free cash flow, on the other hand, is not as easy to manipulate; consequently, many investors favor free cash flow over earnings. Next, we'll compare this against the company's price-to-sales ratio, which reveals how much investors are willing to pay for the company's revenue. Based on this framework, we're looking for a company that has a high FCF/S percentage and a low P/S -- a company efficient at converting sales to cash and that's not too richly valued. Among its peers, American Water Works is the only company to report free cash flow on a trailing-12-month basis. As a result, one would expect to find that the company trades at the highest sales multiple since American Water Works is most efficient at converting the sales to free cash flow. Ironically, we find that Aqua America actually trades at the highest multiple. Evidently, it seems American Water Works isn't too richly valued. We've taken a thorough look at American Water Works from several different perspectives: earnings, free cash flow, and sales. Lastly, we'll examine how well management uses the resources at its disposal to benefit shareholders. By evaluating the returns on equity and invested capital, we'll gain a better sense of management's effectiveness than by looking solely at the company's profits. 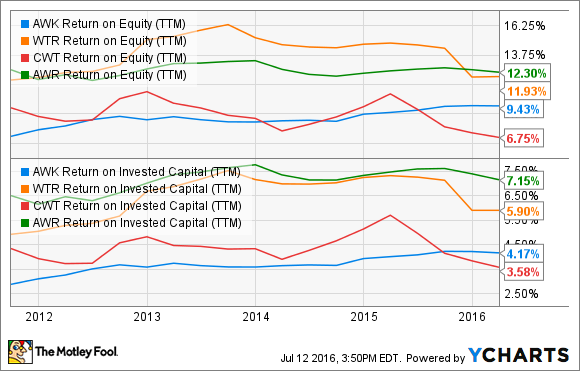 AWK Return on Equity (TTM) data by YCharts. Initially, it seems as if American Water Works lags its peers, consistently underperforming in comparison to Aqua America and American States Water Company. But first impressions can be deceiving. When we compare the companies to themselves, we find that American Water Works outshines its peers -- achieving the greatest improvement over the past five years. 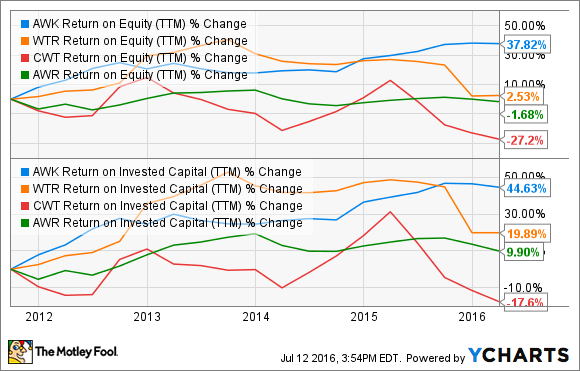 And it seems the company will continue to outperform its peers for some time to come. Valuing a company's stock is never an easy task. Just as there's more than one way to skin a cat, individual investors have a variety of metrics and methods at their disposal to determine whether a stock is fairly priced. Wall Street may believe American Water Works has gotten ahead of itself, but having taken a look at the stock from several perspectives, it seems shares aren't that unreasonably priced. In fact, it may be the company's peers that are overvalued. Volatility in the market has made the safety of utility stocks more attractive to many investors, and this may lead to the perception that they are bound to regress to their means sometime soon. Unfortunately, this may distract investors from recognizing the numerous reasons an investment in American Water Works is a smart move. The advantages American Water Works retains over its competition suggest it will continue to prosper in the future, and that means shares have plenty of room to grow.